This will take place on the 13th of October in Florence, between the hours of 9.00 and 13.00. The event is free and is open to all those interested in the subject, practitioners and patients alike. Dr G Gorga: The new homeopathic normatives. There will also be an open table debate hosted by Dr C Campodonico. 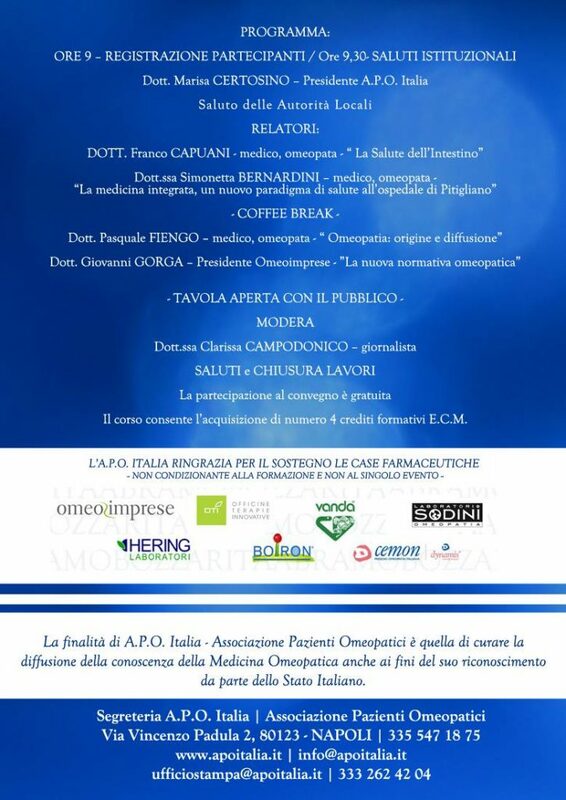 APO also takes action at a European level, so that Homeopathic Medicine is exercised exclusively by surgeons, veterinary surgeons and dentistry-doctors enrolled in the professional register who have taken courses in Homeopathic Medicine recognized by the Italian State; to grant scholarships aimed at the deepening of topics concerning Hahnemannian Homeopathic Medicine.